When CNN had reported Wednesday on an encounter between an Iranian navy plane and the American aircraft carrier USS Eisenhower in the Gulf of Oman earlier this month, the incidence recalled another, almost fatal, encounter two years ago in the Persian Gulf when Iranian speed boats approached U.S. Navy warships including the USS Hooper entering the crowded Strait of Hormuz and when the, well, intruders were reportedly only seconds away from opening fire. Some later argued the incidence and in particular the ‘conversation’ with Iranians was faked by the Pentagon, fatally recalling the August 1964 Tonkin incident which served as President Johnson’s legal justification for commencing open warfare against North Vietnam. The incidence in the Gulf of Oman earlier this month happened while Iran had begun its show of force in a series of ‘routine’ military exercises. Reportedly, the USS Eisenhower was on duty in the Gulf of Oman in the northern Arabian Sea, in support of the Afghanistan (!) war efforts . The CNN article reads that, while the encounter was not threatening, it was unusual. U.S. navy ships have regularly encountered Iranian aircraft in the Persian Gulf in recent years, but not so frequently in the Gulf of Oman. CNN reports that top Navy officer Admiral Gary Roughhead had commented that the Iranians were “not provocative or threatening. As long as they are professional and not threatening or reckless, it’s international space.” Conceded, at least . While all of this sounds quite serious, the notion that the Iranian aircraft was an unarmed, propeller-driven Fokker F27  makes the incidence pretty much ridiculous. It is worth having a closer look at a satellite image or map. 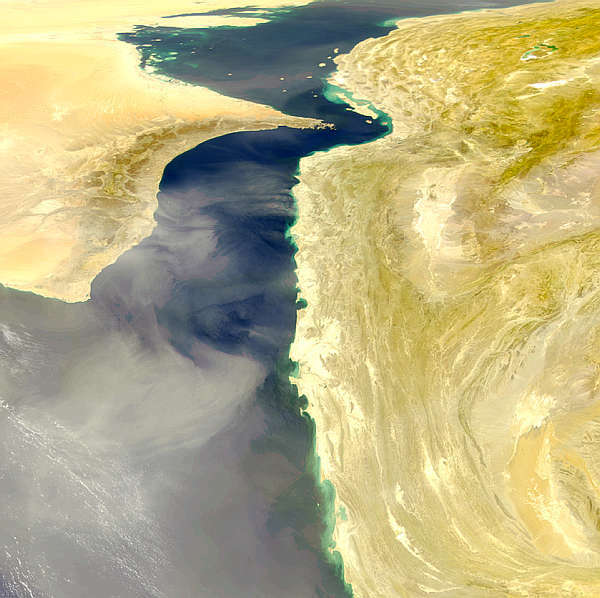 The picture shows an unusual view of the about 200 km wide Gulf of Oman and Persian Gulf from the east. To the right, one can see the barren Makran desert of the Iranian mainland which belongs to the Sistan-Baluchistan province; to the left, Oman and the Trucial Coast of the Emirates, and in-between the narrow Strait of Hormuz. The islands in the middle of the Strait, Abu Musa and the Greater and Lesser Tunbs, which historically belong to Iran, have been an issue of controversy whenever tensions between the U.S. and Iran emerged, so again only a few days ago. Afghanistan is a landlocked country. One might wonder how U.S. officials would respond if an Iranian aircraft carrier (is there any?) would one day show in the Straits of Florida, maybe in alleged support of, say, Venezuela. 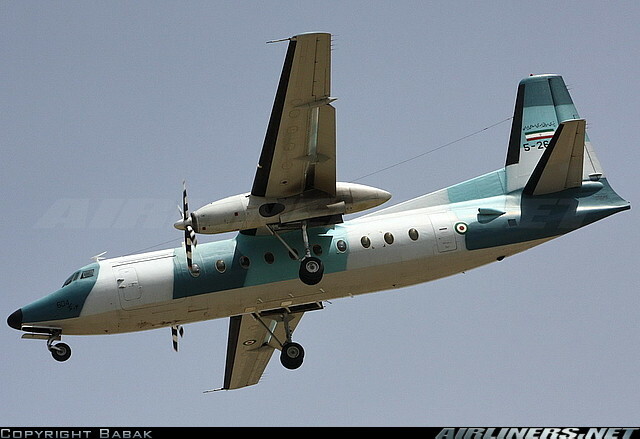 An Iranian Fokker F27 is seen below. Last update April 30, 2010. This entry was posted in Afghanistan, Iran, Oman, UAE, USA and tagged Abu Musa, Fokker F27, Greater and Lesser Tunbs, Gulf of Oman, Iranian speedboats, Persian Gulf, USS Eisenhower, USS Hooper, war games. Bookmark the permalink.